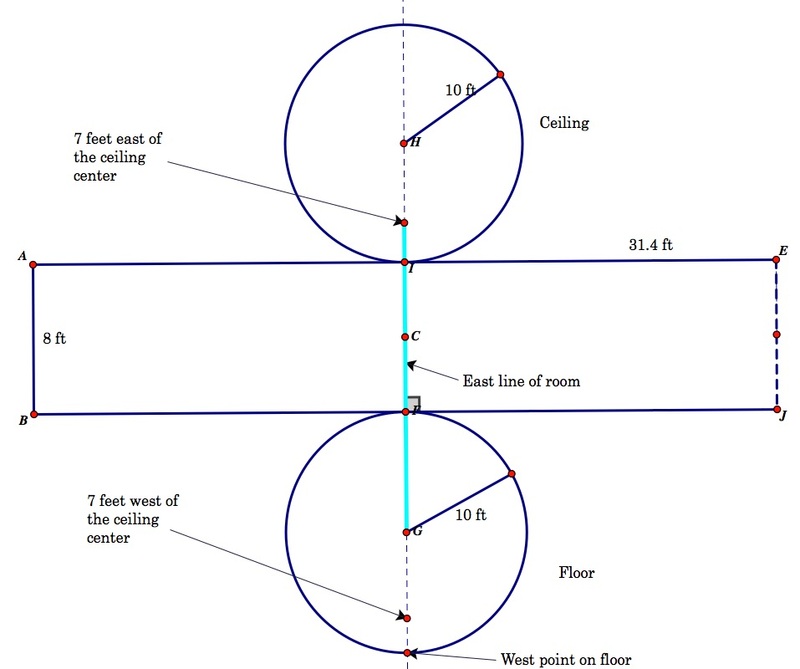 A room has the shape of a right circular cylinder with radius r = 10 ft and height h = 8 ft. A spider is on the room's ceiling, 7 feet from and directly to the east of the ceiling's center. A fly is on the room's floor, 7 feet from and directly to the west of the floor's center. Determine (analytically or numerically) the minimum distance the spider would have to crawl in order to reach the fly. Reference: SSM 4545: Proposed by Michael Saunders, Durango, CO. Note: Rick Blake, a mathematics educator from the University of New Brunswick, published an article in the Mathematics Teacher on a spider and fly problem in a regular room. Blake, R. (1985). Fly and Spider, Mathematics Teacher, 78, 98-104. A room has the shape of a rectangular parallelepiped with width and length of 20 ft and height of 8 ft. A spider is on the room's ceiling, 7 feet from and directly to the east of the ceiling's center. A fly is on the room's floor, 7 feet from and directly to the west of the floor's center. Determine (analytically or numerically) the minimum distance the spider would have to crawl in order to reach the fly. Is Blake's problem easier? Can the method there be used on the current problem? Return to EMT 4600/6600 Page.